She made her bed and it is entirely right that she lies in it. 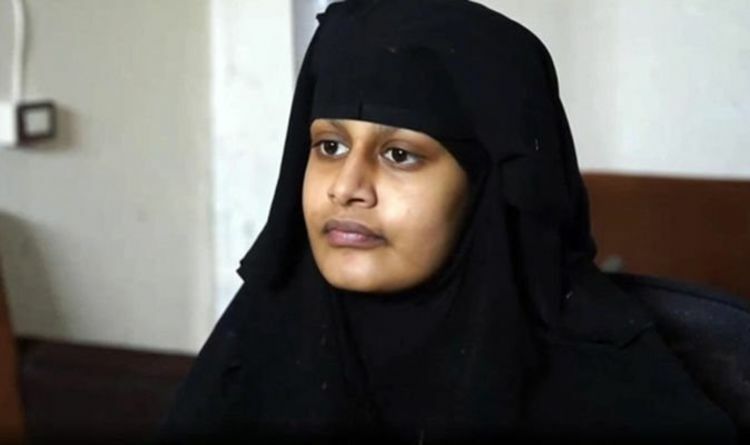 By running away from her home in the East End of London to join IS and, if the latest allegations are true, acting as a key instrument of IS power in the area of Syria in which she was living, Begum became a willing part of one of the evilest regimes in human history. The idea that, because she was a schoolgirl at the time, she somehow deserves our sympathy is risible. It is clear from her own words that she knew exactly what she was doing. So it is hardly surprising that there has been a wave of outrage at the news that Begum has applied for, and been granted, legal aid to fight the Home Secretary's decision to strip her of British citizenship. It utterly sticks in the craw to think of such a woman being able to spend taxpayers' money in her defence. The news that her family is using that money to hire Gareth Peirce, the go-to lawyer for every alleged jihadist and terrorist, adds to the anger. Human rights advocate Miss Peirce is hugely successful in her chosen field, having previously represented hate preacher Abu Qatada, Moazzam Begg, who was held at Guantanamo Bay as a terror suspect, the Birmingham Six and one of the Guildford Four. Begum's family are clearly determined to do everything in their power to win. So it feels doubly sickening that taxpayers' money is being used to try to defeat the government's decision to act against Ms Begum. But sickening as it feels, it is also entirely right. It is precisely because Begum is quite correctly reviled that we must ensure that she is treated fairly under the rule of law. And it is even more important that she – or anyone else – should have the right to challenge the decision to strip her of her citizenship: or any other decision made by a minister. Under the Caliphate which Begum championed, it was IS's arbitrary and cruel interpretation of Sharia that governed day to day life. We have built a society in which everyone is subject to laws which are passed by a democratically elected Parliament and, crucially, where everyone has a right to challenge the application of those laws. Whatever our background and whatever we have been accused of, we all have equal right to a fair hearing. That right is not something that only those who behave well are entitled to, and those who offend our definition of good behaviour are denied. That means that while the rule of law is the guiding principle of how we run our affairs, we equally have to ensure that everyone is able to benefit from that. So for those who cannot afford or cannot access a lawyer, the taxpayer steps in with legal aid. There are arguments raging at the moment around cuts to legal aid, which many believe is not operating as it should and which is denying that right to too many deserving people. For example, the other day Molly Russell's family were refused legal aid for an inquest into her suicide, said to have been exacerbated by social media. That is an important issue but in the current context of the row over Begum receiving legal aid, it is the principle which we need to focus on – and which it is vital we uphold. It is easy for us all to agree that, for example, a junior school teacher with an unblemished 30-year record should be granted legal aid to fight an allegation of, say, violence. But it is those cases where we are all united in horror that show us at our best. However grotesque Begum's behaviour, and however right it feels that she is punished for that behaviour, it is vital for all of us that such decisions are not arbitrary but subject to legal challenge. Imagine a nation where politicians – or rulers, as we would have to call them – take decisions that cannot be challenged. They exist: and they are called tyrannies. Our laws and society are not, and never should be, run on gut instinct – that because we are repulsed by what Begum stands for, she should be subject to arbitrary decision making. Tyrannies are run on the gut instinct of the tyrant. Democracies are run on the rule of law – and that means those in authority over us are sometimes compelled to explain themselves in a court of law. Shamima Begum's legal action may be disgusting. But it is what makes us free.